At the present I teach French, Italian, and occasionally Latin at Loyola University in Baltimore. Here's a link to my page there. For many years I taught Italian at the Peabody Institute in Baltimore. One of my students gave me this great collage illustrating various ways people perceive the Music Major. I got my Masters and Ph.D. in Comparative Literature from Penn State, and managed to see only one football game in my time there (actually two half games). I sat in a booth next to Joe Paterno's once at a local pizza parlor. I did my undergraduate in Classical Philology at the Catholic University of Louvain in Belgium, a.k.a. 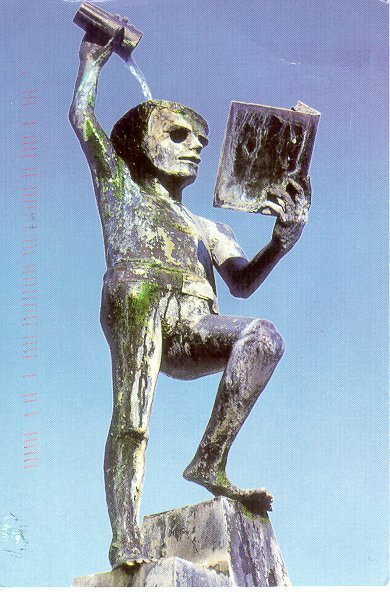 fons sapientiae, the fountain of wisdom. Fonske is their mascotte. Before that I went to Saint Ignatius College in Antwerp, now part of the University of Antwerp. And before that I went to Franciscus Xaverius College. Do I know Jesuits?